Les Larson prides himself on being an active, self-sufficient sort of guy. He mows his grass. He chops his firewood. He carries his golf clubs. About a month ago, not long after Larson felt a dull ache in his left arm and burning pain in his chest, all of that changed. After undergoing triple-bypass heart surgery, the 56-year-old coach of defending Class A state champion Breck wasn’t even allowed to drive himself to practice. That task, among numerous others, has fallen on Peter Larson, Les’ 23-year-old son and Mustangs assistant coach. With Les Larson relegated to the bench during practices (doctors won’t let him lace up his skates for another month or so) and in the stands during preseason scrimmages, Peter Larson, a St. John’s graduate working on his graduate degree in teaching, has taken over many of his father’s duties ---- albeit with dad right there, peering over his shoulder. Les Larson, going back to his playing days as a standout defenseman at old Hill High School and then at Notre Dame, always has been the sort to stick his nose in the fray. Observing quietly isn’t one of his strengths. Last season was Larson’s first as Breck’s head coach. 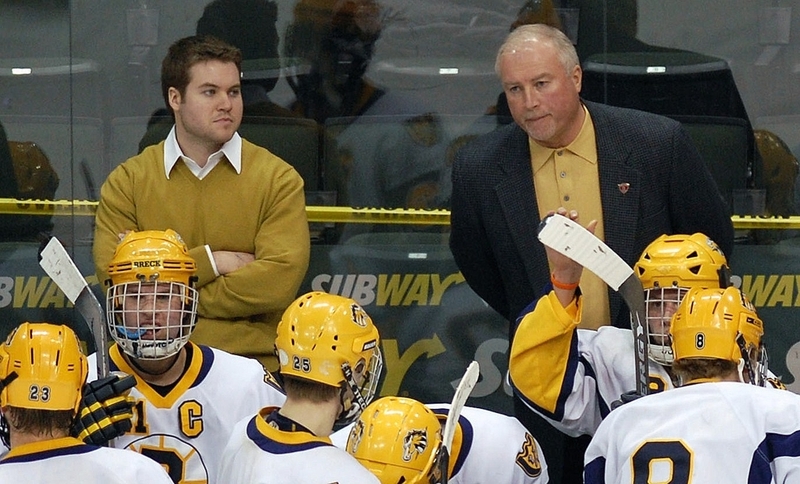 He led the Mustangs to a 27-3-1 record that included a convincing 7-3 state championship game victory over Warroad. All but two seniors return from that team, and Breck is ranked No. 1 in the MN Hockey Hub’s preseason state Class A poll. Talk to those close to the Breck program, and it’s clear that all those victories and that state championship trophy are not the best ways to measure Larson’s impact on the program. Instead, he is better defined by four capital letters: BAGG. Breck’s players have swallowed their coaches’ philosophy in one all-consuming gulp. The Mustangs were as much a precision machine (think: Swiss watch) than they were a hockey team at last year’s state tournament. “He says all those sayings to us every day,” said senior forward Tyson Fulton. “He’s a really unique coach. Sometimes though, Fulton says, Larson’s message can be difficult to interpret. One example of a “Larson-ism” that might have sailed over his players’ heads: Larson recently was presented with a gold-plated whistle by players and parents at a preseason meeting. “My comment was, ‘That’s like somebody on death row paying the electricity bill,’ ” Larson said. Which is one way of say Larson isn’t afraid to make his players skate. Whatever Larson is selling, it’s popular with the boys at Breck. There were 47 that tried out for the varsity, a record for the school and an astounding percentage of the student body considering there are only about 200 boys in grades nine through 12. These days, despite all he’s been through, Larson describes himself as a “lucky guy” for having his heart surgery when he did. Larson figures he’s pretty fortunate, too, for having Peter as his son.